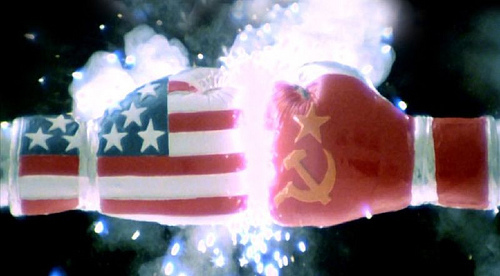 So… should Rocky IV have been classified? According to Department of Defense reviewers, the “major enemy threat facing the United States” in 1975 must remain classified information. We can know that, “This situation had been prevalent for a number of years and was likely to continue for the foreseeable future,” but not that –ostensibly to protect US “national defense or foreign policy”– the Soviet Union was the Cold War rival to the United States. This redaction serves as further proof of the broken declassification system and the vast swaths of historic information that remain (even after a FOIA review) overclassified and restricted from the public. 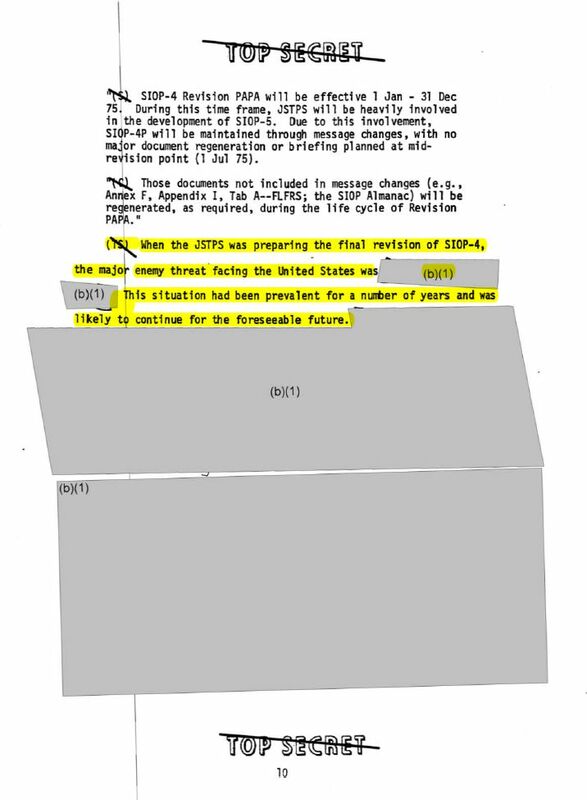 The redaction of our Cold War rival was censored from a 1982 history of the United States SIOP (Single Integrated Operational Plan), which was the plan for where nuclear weapons were to be launched in the event of a nuclear war. (Check here for more declassified documents on the SIOPs.) My colleague, the FOIA Yoda, Bill Burr, originally requested this history in 2003. It was reviewed three times (by the Department of Energy, the Joint Staff, and the DOD Information Management Division) before its highly redacted release. Of course, Burr has appealed the redactions, and the document is now in line to be reviewed yet again. I doubt that “the Soviet Union” was properly redacted, even in a technical sense — (a) millions of pages of historic military plans have been released; (c) knowing that the Soviet Union was our enemy does not require an “intelligence method” beyond reading a newspaper, and (d) the idea that we could hurt the current Russian government’s feelings by “revealing” that we had nuclear weapons pointed at them is laughable. Our democratic principles require that the American people be informed of the activities of their Government. Also, our Nation’s progress depends on the free flow of information both within the Government and to the American people… Protecting information critical to our Nation’s security and demonstrating our commitment to open Government through accurate and accountable application of classification standards and routine, secure, and effective declassification are equally important priorities. I would be eager to hear a response from a declassifier as to why this redaction is necessary. I suspect that they may claim that their hands are tied and their classification guides and the president’s Executive Order on Classification require them to redact that the Soviet Union was our enemy during the Cold War. * This reliance on poor guides leads one to question how beneficial the recently heralded reduction of classification guides throughout the government has been. True, there are now marginally fewer classification guides, but the remaining guides still force declassifiers to continue to nonsensically redact information; so, has the system really improved? Finally, some may see protests of the redaction of who we fought the Cold War against by the Department of Defense as a whiny quibble, but I see it as the pinnacle of the iceberg of the state’s indifference to the people’s right to know. This idea of a limited government subservient to the people was, after all, a primary reason we threw off the chains of tyranny and fought our Revolutionary War against [redacted]. *They could also argue the “slippery slope” argument: that if the US government acknowledged that it had aimed weapons at the USSR, it could have to acknowledge other countries that it has aimed or is aiming its nukes at. Still, shouldn’t we, the public, have the right to know which countries our government is poised to annihilate? We know that the real threat throught the Cold War was the Space Aliens from Proxima Centari. But since that’s technically not “foreign relations” the redaction should be challenged! Where in this document is the USSR named?